May Pilipino sa pagsilang, May Pilipino sa paninindigan. The UniversiTV team combines marketing, advertising, broadcasting, sales and production experience. 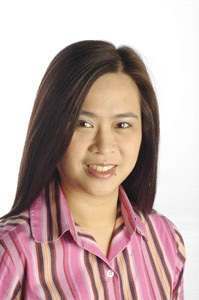 Gema’s well-rounded background has prepared her to be a Slasher*: She had stints with Batibot World of Children and ABS-CBN, and as public relations officer for Days Hotel Philippines. At DCM Advertising, she was account manager on Disney and Eastern Telecoms. She then moved to Probe Productions as public relations manager for Gameplan, Probe Team, I-Witness, 5 and Up. She was 5 and Up Club Manager. At Araneta Center, she was the client representing the complex. She joined Adformatix in 2001 to head the new business team, which burgeoned under her charge into a profitable below-the-line and content company. While she was behind the camera throughout her career, she is today a LifeGuide on UniversiTV’s daily TV program with the same name counseling students. Gema has double majors in Speech Communications and Broadcasting from the University of the Philippines. * Slasher: A term coined by the staff to describe the desired trait of being multidisciplinary. It means that the person described is capable of doing and does the job of several people -- and well, e.g., events manager slash writer slash artist slash photographer. Young blood and experience in the veins of UniversiTV.